Greetings, Adventurer! If you like our logo and motto of "Come Forth from Mom's Basement!" then be sure to check out our awesome t-shirts at Cafe Press. 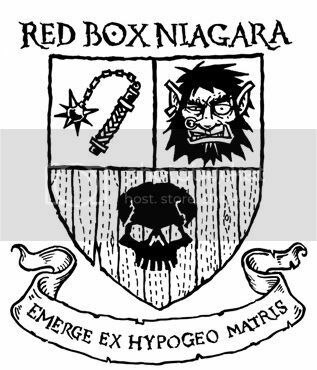 What is Red Box Niagara? This site is devoted to a group of gamers in the Niagara Region (Ontario, Canada) who play Classic Dungeons and Dragons. See our Aboot section for frequently asked questions.